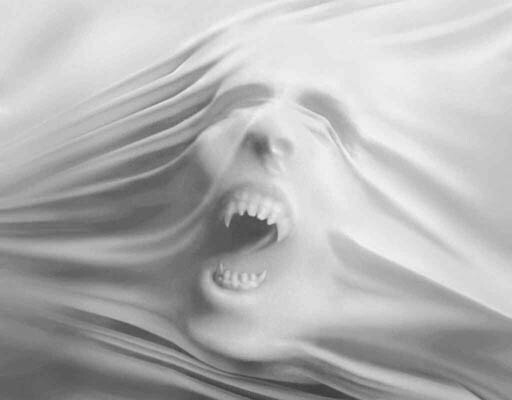 popular topic of mine within the world of the supernatural are the vampires. The never ending hunt of humans, or other vampires for that matter, for the life giving elixir of blood. Kind of gives you the creeps a little doesn't it? History is full of many different type of vampires and dates back almost as far back as man itself. In recent years with the advent of Buffy the Vampire Slayer, Angel, and several vampire movies, such as Interview with a Vampire and Blade, vampires are finally getting in the lime light. So what really is a vampire? Well I suppose that is a matter of perspective. Humanity with its great and overwhelming fear of death has created some spectacular, truly inventive, and widely varied creatures to stalk them at night. Most of them come from a different era when life, and death, was a little more simple. People in general were very superstious and many still are today. Because of that, the vampires in folklore are very much catered to the culture that they derived from. The one commonality to them all is the life stealing, either through a draining of a victims lifeforce, drinking of blood, or just out right killing. Along the with variety of different vampires around the world, humanity needs to maintain a certain amount of security. Why is that important? Most of us do not like to feel helpless. We would hope that if there is a big bad creature out there that someone would be able to handle it, that there would be something that would stop it, slow it down, or at the very least, scare it away. I mean everything has a weakness right? We all need to feel that something that is that dangerous can be dealt with, so we give this creature of legend a fault. Throughout history there are a variety of weaknesses and even more signs and signals to help us detect a vampire. Lets start with weaknesses first. One of the most common is holy or blessed items. These must be truly blessed by a person of true faith. This could be a priest or some guy down the street as long as he has faith. The more faith they have the more powerful it is in most cases. It should be noted that status in the clergy doesn't not automatically mean you have faith. The said item will then actually cause physical damage when coming in contact with the vampire. Typically this really hurts , as in true blue, screaming bloody murder (pun intended), knee slapping pain. This not only hurts the flesh, but they feel it to their soul. In almost all folklore this is pretty universal. Another weakness that for the most part is a wide spread belief is that sunlight will kill a vampire. Being that it is creature of the night, it would make sense that it would stay away from the sun. Depending on which legends or books that you read, you will get varying stories. Some of them will say that sunlight will kill a younger vampire, but if it has been around for several centuries it can get around in the day, but it just doesn't like it. Many of the folklore tales state that sunlight will kill them no matter how old. One of the other common weaknesses that almost everyone has heard about is garlic. Garlic can be very effective against vampires in many legends. Some say that just the smell alone is enough to drive them away and if it comes in contact with the skin will actually burn like a blessed item or fire. Other legends talk about the smell of garlic making the hunger for blood stronger, almost like an aphrodisiac, and so they stay away from it because they do not like the loss of control. A weakness that I have always found amusing is the invitation rule and running water. The first one is simply that a vampire can not, physically or otherwise, come into your home unless he is invited in first. The reason that I find this amusing is that that must have been a convenient answer for someone at sometime to appease the paranoia of some people so that they could sleep at night and it stuck. The same strikes me as the reason for the other weakness I mentioned that a vampire cannot pass running water. I have only covered a few of the disadvantages that tales and stories have given vampires, and they must sound rather simple and outlandish. You are are right, they are. I must reiterate that most of the tales and folklore about vampires and many of the other creatures I will talk about, are from a time in our history when people actually truly believed they were real, and the consequences could be serious. You could be ritually burned if found to be a vampire. Given some of the powers that I am going to describe below, vampires seemed like a force that could not be stopped. So what is a mayor of a small town to do when the people of his village are in an uproar? That they don't know if they can stay knowing that there are vampires in the area, I mean a man has to look out for his children, right? So he tells them that vampires can't come into your home unless invited, or something, to make it so that everyone calms down and goes back to their lives satisfied that they feel safer and the situation is handled. So when the children are scared that there may be vampires around the parents can now tell them the same thing that the mayor told them. I am not here to burst anyone's bubble so I will say this as well, almost all legends and folklore are based off something very close to that which has happened or appeared to have happened at one time. These means that I can not discount the possiblity that vampires, or any of the other creatures that I talk about on this site, might exist or have existed in the past. So lets talk about how are you going to recognize one of the blood sucking fiends when one comes in your neighborhood. The number of signs for a vampire are truly numerous, so I will only cover some of the well known ones. Many of the weaknesses described above were used to identify vampires as well. One that seems to show up often enough is that some vampires do not cast a reflection. There are several theories as to why this is. Some say that since the vampire is dead he no longer is a being that projects an image. The reason that humankind can see them is because we have a soul. Others say that the vampire actually can do this at will, allowing them to sneak up on people. In this day and age with cameras and many different kinds of video equipment, this can definitely be an advantage as well as an easy tip off of the supernatural. Being a creature of the night, there have been many instances where the vampire has been protrayed as very light sensitive. Light in and of itself will not do damage to it, not like sunlight, but it might be painful. Depending on the legends, some nostferatu were so sentive they could barely tolerate torch light, while others could walk inside a bright office building with confidence. Realize, as with most folklore, the tales are widely varied from mild to extreme. There is an obvious sign that is the visual standard for our bloodsucking friends, and that is the fangs. The two main types that are typically portrayed are retractable and not. 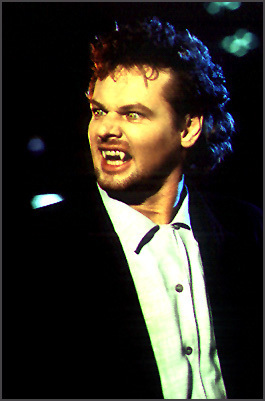 Enough of the serious mumbo jumbo stuff and on the the good stuff, the benefits of being a vampire and what they can do. Probably one of the most obvious is the increased physical prowness and acute senses. Typically speaking with the heightened senses comes a slight increase in intelligence as well. 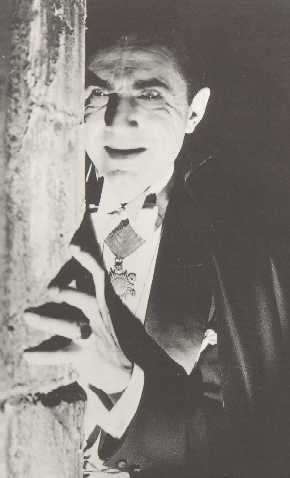 Vampires have been known to hear a human's heart beat from a block away. They also have been known to pick up a human and throw him almost as far. That in and of itself is very impressive, but that is not all! Oh no, not in the least. Imagine if you will a creature that can talk with the dead, talk to animals, and can take on the shape of those animals it talks to. It can also in some cases take on the shape of mist to sneak into houses and feed off of the unsuspecting victim. Then there is psychic ablitities, an aura of overpowering charisma, shadow manipulation, hypnosis, weather control, illusions, magic, not to mention the fact that in most normal situations, they are practically indestructable. That is quite the list, don't you think? The most impressive of all is the fact that they don't age. They are undead so unless they are completely destroyed, they will not die, ever. This has its pros and cons. One of the bigger pros, and in my mind the most powerful benefit they have, is the time they have to experience the world and life. They can spend a couple of decades in France, learn to speak the language, the culture and people, and then move on and go somewhere else. You can imagine how much a vampire would know after a couple hundred years. The con is that it is a lonely existence. If you were to fall in love with a human, you would watch as they slowly grew old and died. They could turn them of course and then they would have a companion forever, but who is to say that they would stay with you, forever is a long time. Also the vampire would have to consider if they are willing to make this person feed off of blood to survive. Not everone could handle that, they may get angry at you or go insane. Then not only would the person you love not be the same, they would be crazy for eternity. Well all of this info is fine and dandy, but what about some action. I mean this is the age of technology right? We should be able to see all this if we want to. If Mel Gibson can do Hamlet, surely there are some vampire movies to rent. Good call, there most definitely is a ton a movies out there. I have started to compile a list sorted by the year it came out. One thing I want to make perfectly clear, I am NOT guaranteeing the quality of these films. These cover a wide variety of the subject from an opera, to kids movies, to chainsaws and blood. The only thing that I am guaranteeing is that they are related to vampires. There are a view that I do recommend. Blade, Interview with a Vampire, John Carpenter's Vampires and Lost Boys are some of the better ones out there. Bram Stoker's Dracula, the new one with Keanu Reeves, is rather good as well. If there is a movie that you saw or know of that is not on this list PLEASE LET ME KNOW!!! I am trying to keep it as updated as I can. Thanks! Now comes the older form of telling tales, books. Over the years there have been tons of authors that found the subject of vampires interesting enough to write about it. There is a certain sensual appeal to concept of a vampire, a romantic horror almost. It is a rather frightening idea, but you wonder about the power that they have. Writers latch on to this and spin a tale that can have you curled up on the sofa for hours, or on the edge of your seat for hours. Wow, I know you are impressed to discover that someone out there decided to write about all this, but while I continue to babble, you just want me to tell you who some of these people are. Alright, fine, if you don't want to listen to me I will tell you. One of the most prolific fiction writers of our time on the subject is by far and large Ann Rice. With nine vampire books in publication right now she had brought to readers a vivid underground world of vampires and secret scholars. It shows the incredible strengths and weaknesses to being a creature of the night. One of her books, Interview with a Vampire, was made into a film as well. As an avid reader, specifically of folklore and fantasy, she comes highly recommended especially since she writes more than just vampire books. The characters feel real considering the topic and this is a rarity with many writer. Here are some of her books. There are thousands of books out there on the subject, there would be no way for me to list them all. I can tell you about a few more other than Ann Rice, however. There is a series by Laurell K. Hamilton, about Anita Baker, a vampire slayer. In this world, everyone knows of their existence, as a matter of fact, the Supreme Court gave them equal rights. As of right now there are 9 books that I know of in the series and the first novel is called "Guilty Pleasures". Of course there is the standard, Bram Stokers "Dracula". There is a reason that this is a classic, it is very good. Realize when this book was written when you read it though. This was around the turn of the 1900s and it was a different time. A time when fantasy and fiction written in this kind of context seemed very...real. This book stirred up the public like nothing else. Some thought it was great (that would be people like us) and others thought it was just horrid. Different morals from a different time. It has lasted the years and is still the number one known vampire in fiction. May the Lord Dracul live forever in the pages. Inspired by this famous nosferatu, there are a few different series of books based off of Dracula. One of them is "The Diaries of the Family Dracul" and the first book is called, "Covenant with a Vampire" The author is Jeanne Kalogridis, and it is a rather good series, I was impressed. Family politics and deals, it reads more like a drama than horror. Over all it did Dracula and his family justice and then some. The other series that I know of about Dracula is by Fred Saberhagen and is, as far as I know, up to nine books. The first novel is "An Old Friend of the Family" and it is not too bad. I know my friend loved it, but it wasn't one of my favorites. Don't not read it because I said something negative however, it is definitely more than worth the time to read. Getting back to more of the traditional horror type storyline, Brian Lumley comes up with a different angle to the slayer type. The "Necroscope" series, which is the name of the first book as well, is based on the main character being able to talk to the dead and subsquently discovering that vampires exist. After seeing some of what the vampires do to humans, the battle is on. An excellent set of books, and the storyling continues in the Vampire World Series. That covers most of the classics and series, let talk about some individual books now. The first one must be "Vampires" by John Steakly, this is what the film John Carpenter's Vampires was based off of. The book is much better than the movie I must say and I enjoyed the film quite a bit. Again, this is about purging the world of the plague of vampires and the "slayers" are hired by the church. What kind of person would I be if I didn't talk about "I, Straud"? This is almost a classic, but not quite. Good enough that if I didn't put it on my site, my wife would probably smack me upside my head for having a brain fart moment. This is old style vampire, written by P. N. Elrod for the Ravenloft set of books. It is a stand alone and is about a man that falls in love with his brothers wife, and how far he would go to get what he wanted. Another book that I have read, and unfortunately I don't think it is in print right now, is "Sins of Blood". This is one of the few where the storyline states that the world at large knows that vampires exists. In this tale, they are to be exterminated and the federal goverment is the official group to handle this. One of the reasons that I like this particulare novel is that it tells about hereditary vampires as well as vampires that have been turned. Heriditary vampires are defined as someone that has mated with a vampire and they have a child. That child will show a few small oddities growing up, but will look, act and be human. When they come to that time in their life that they have reached sexual peek, they then turn "naturally". If you can find it, it is a fantastic book. The last item to cover would be gaming. I roleplay Vampire, the Masquerade with GURPS once a week. For those of you that have no idea what I just said, I will explain if you click Here. 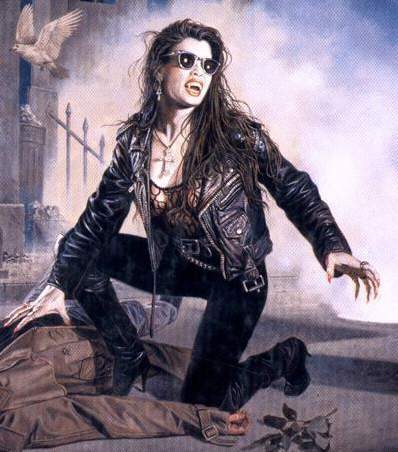 GURPS has made a Vampire, The Masquerade and a Vampire Companion which will give you all that you need system wise to play if you choose to use GURPS. Most of the books out there right now, system books and more importantly source books, are made by White Wolf. It is there logo and link on the bottom of the page as I have used some of their art. There is a LOT of vampire books out for this system and a full, rich world that they portray. Even if you are not a gamer, it might even be worth it to you read them anyway. Well that is it for now people. There is plenty to add in still, so if there is something I missed that you think really should be on this page, first you need to get a hold of me. I would recommend the email button above. Second tell me exactly what is on your mind. Hope to hear from you soon!